Each year the Centre selects from 3000 to 3500 course participants to attend training activities selected from a pool of more than 8000 candidates. On average 60% of the participants are from developing countries, LDCs and transition countries. The average length of stay for conference participants is from 10 to 15 days. The peak period for visitors is July. 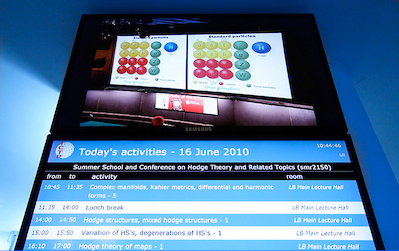 Each year nearly 1500 lecturers make presentation or lead seminars for participants attending ICTP training activities. On average 14% of the them come from developing countries. ICTP conferences and workshops are open to scientists and students from member states of the UN, UNESCO and IAEA. 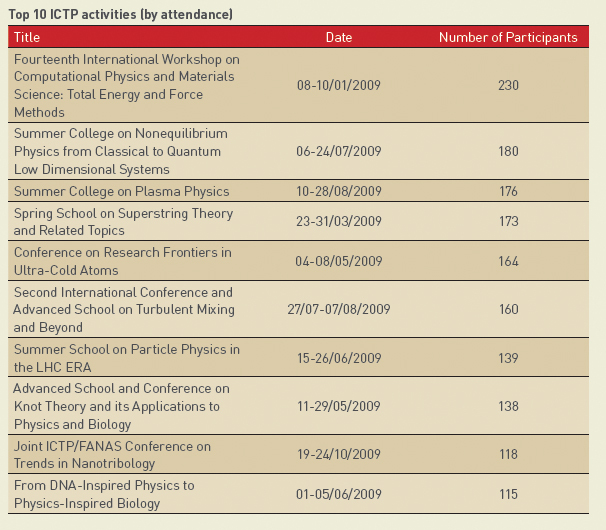 ICTP scientific calendars 2010 and 2011 are available for the annual list of activities. In 2009 ICTP provided 1323 months of training to 3412 course participants for an average length of stay of 12 days. 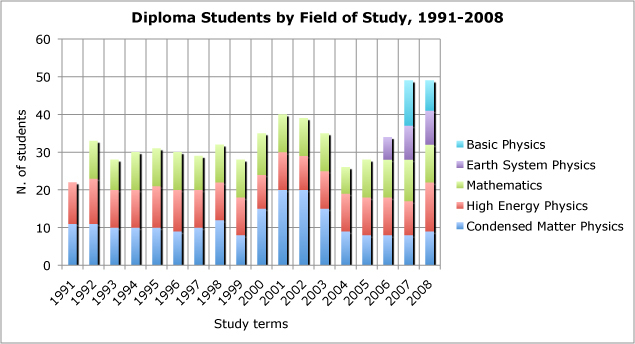 Diploma Programme. 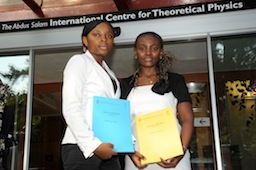 During the 2008-2009 study term, 49 students from 23 countries have participated in the Programme including 8 young physicists from Sub-Saharan Africa who have attended the new one-year Diploma Programme in Basic Physics. Since 1991 nearly 600 students from 66 countries have participated in the Diploma Programme. ICTP-IAEA Sandwich Training Educational Programme (STEP). 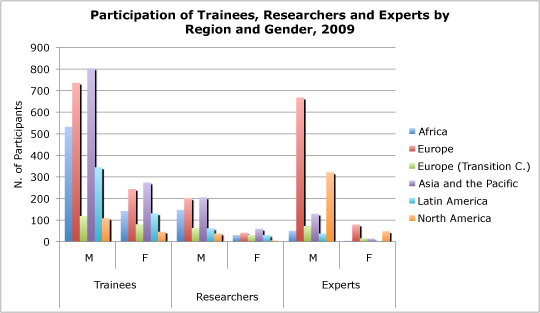 In 2009, 40 fellows (14 women) participated in the programme for a total of 46 visits. Associate and Federation Schemes. Since the programme's inception in 1964, about 2,500 scientists from nearly 100 developing countries have been chosen as ICTP Associates. 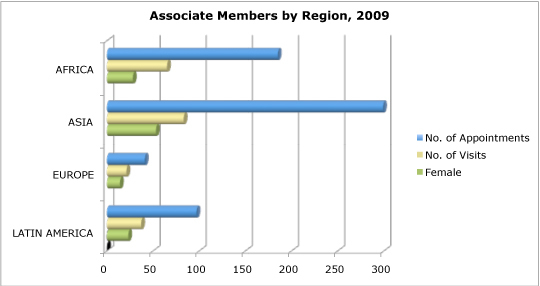 In 2009, 622 Associate Members were appointed (19% were female): they generated 206 visits by 200 individuals for a total of 9,518 days or 312.91 person-months they produced 38 scientific papers; fourteen Associates from the following LDCs visited ICTP: Bangladesh, Benin, Burkina Faso, Burundi, Eritrea, Ethiopia, Guinea, Lesotho, Madagascar, Mauritania, Nepal, Niger, Rwanda, Senegal, Sudan, Togo, Zambia. In 2009 ICTP had a total of 111 Federation Arrangements. The total number of visits under the programme was 78. 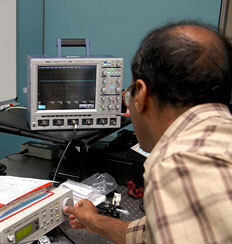 Training and Research in Italian Laboratories Programme. 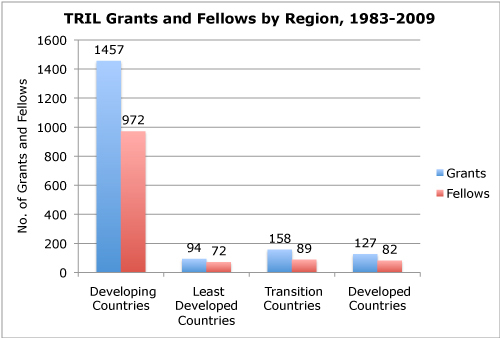 Since 1983, the TRIL Programme has awarded 1,836 grants to 1,215 fellows from 82 countries. Nearly 400 Italian laboratories have participated in the Programme. In 2009 the total number of TRIL fellows present in Italian Laboratories was 107, while 76 new grants and 33 extensions to existing grants were awarded. The following African countries were represented: Cameroon, Cote d'Ivoire, Egypt, Ethiopia, Madagascar, Malawi and Nigeria. The Office of External Activities (OEA). 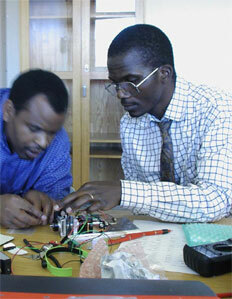 The OEA coordinates physics and mathematics activities in developing countries. Such support complements the training and research provided through the Centre's Trieste-based programmes.